The SFA Wind Ensemble will present "Eventide," a program featuring works with a nighttime theme, at 7:30 p.m. Tuesday, April 17, in W.M. Turner Auditorium on the university campus. NACOGDOCHES, Texas - Works by composers John Mackey and Joseph Schwantner will be featured when the Wind Ensemble at Stephen F. Austin State University presents the program "Eventide" at 7:30 p.m. Tuesday, April 17, in W.M. Turner Auditorium on the SFA campus. "The pieces on this concert share a nighttime theme," said Fred J. Allen, director of bands at SFA. The featured work is Mackey's "The Night Garden." "The Wind Ensemble has played quite a few compositions by American composer John Mackey," Allen said. "His pieces contain remarkable color in the orchestration." Also featured will be Schwantner's "In Evening's Stillness," which will be conducted by Dr. David Campo, associate director of bands. "This is the final piece in a trilogy of pieces Dr. Campo has conducted with the Wind Ensemble in the past few years," Allen said. "He previously led the band in performances of ' … and the mountains rising nowhere' and 'From a Dark Millennium,' the first two pieces in this set." The band will also perform pieces by Andrew Boss and Steve Danyew, both of whom are emerging American composers. 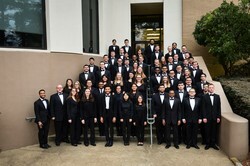 The concert is a joint presentation of the College of Fine Arts and School of Music. Turner Auditorium is located in the Griffith Fine Arts Building, 2222 Alumni Drive.